Old hammered coins were made in the first millennium BC using the hammered production method. As well as using the hammered method, many earlier coins were also made using a mould, where one mould was able to produce up to as many as 30 coins at one time. The mould method is well known to have produced, what is known as as, a tree of coins which would usually have a central hole. From there the coins were individually broken off and called cash. The word cash, as we know it today, originated from its colloquial use in China many centuries ago. Although this method was used in China up into the 19th century, the technique is no longer used today. In England coins were made using the hammered technique all the way through the reign of Charles II in the year 1662. 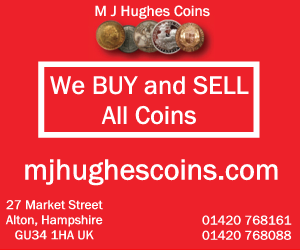 Although that was the main method of production up until then, around a century before milled coins were slowly evolving in both the standards which they could be made to, and the methods that were being used to make them. In order to make a hammered coin a blank piece of metal, also known as a flan or planchet, is placed between two dies. The type of metal that is used can alter depending on the output that you require. For example, should you require hammered gold coins or hammered silver coins then you can simply use the metal of your choosing as the flan. The weight of metal that is stuck between the two dies alters depending on the value of coin that the manufacturer wishes to make. After the die is stuck between the two dies, the upper die is hit with a hammer which in turn imprints an image on both sides of the coin which is derived from the embossed image on both on the dies. The flan is usually taken from a mould in order to ensure that the measurements are exact. Despite efforts to make everything exact, that is not always the case as we can see from the output. Many Celtic hammered coins, and English hammered coins, appear less than perfect such as ones that are off-center, have letter missing and some even have misspellings! As well as making hammered coins, some people made some money through taking as much as 1 gram off of the weight of a 6 gram coin. In fact, the extent to which this went on can be best understood by the sheer volume of old Charles 1st coins that are not fully round, and that do not have their legend fully in view. The process by which hammered coins are made has played a role in the evolution of other manufacturing technology. Much like anything, there is usually a clear demand for a certain method of production which can then be applied throughout other manufacturing processes. Today, many museums allow tourists and visitors to make a coin through sticking a modern day coin, the flan, in a machine and then pulling a handle, which operates the hammer like function, which in turn produces a souvenir. The Author Anthony Travis writes articles about Celtic Hammered Coins. 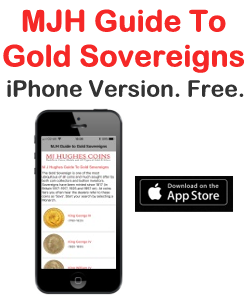 Further articles written by the author related to Hammered Silver Coins which are available on the web. 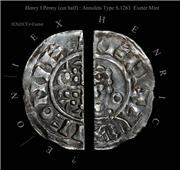 GB Henry Hammered Long Cross Penny!! !